In 2003, astronomer Mike Brown and his team from Caltech began a discovery process which would change the way we think of our Solar System. Initially, it was the discovery of a body with a comparable mass to Pluto (Eris) that challenged the definition of the word “planet”. But in the months and years that followed, more discoveries would be made that further underlined the need for a new system of classification. This included the discovery of Haumea, Orcus and Salacia in 2004, and Makemake in 2005. Like many other Trans-Neptunian Objects (TNOs) and Kuiper Belt Objects (KBOs) discovered in the past decade, this planet’s status is the subject of some debate. However, the IAU was quick to designate it as the fourth dwarf planet in our Solar System, and the third “Plutoid“. Makemake was discovered on March 31st, 2005, at the Palomar Observatory by a team consisting of Mike Brown, Chad Trujillo and David Rainowitz. The discovery was announced to the public on July 29th, 2005, coincident with the announcement of the discovery of Eris. Originally, Brown and his team had been intent on waiting for further confirmation, but chose to proceed after a different team in Spain announced the discovery of Haumea on July 27th. The provisional designation of 2005 FY9 was given to Makemake when the discovery was first made public. Before that, the discovery team used the codename “Easterbunny” for the object, because it was observed shortly after Easter. In July of 2008, in accordance with IAU rules for classical Kuiper Belt Objects, 2005 FY9 was given the name of a creator deity. In order to preserve the object’s connection with Easter, the object was given a name derived from the mythos of the Rapa Nui (the native people of Easter Island) to whom Makemake is the creator God. It was officially classified as a dwarf planet and a plutoid by the International Astronomical Union (IAU) on July 19th, 2008. Based on infrared observations conducted by Brown and his team using the Spitzer Space Telescope, which were compared to similar observations made by the Herschel Space Telescope, an estimated diameter of 1,360 – 1,480 km was made. Subsequent observations made during the 2011 stellar occulation by Makemake produced estimated dimensions of 1502 ± 45 × 1430 ± 9 km. Estimates of its mass place it in the vicinity of 4 x 10²¹ kg (4,000,000,000 trillion kg), which is the equivalent of 0.00067 Earths. This makes Makemake the third largest known Trans-Neptunian Object (TNOs) – smaller than Pluto and Eris, and slightly larger than Haumea. Makemake has a slightly eccentric orbit (of 0.159), which ranges from 38.590 AU (5.76 billion km/3.58 billion mi) at perihelion to 52.840 AU ( 7.94 billion km or 4.934 billion miles) at aphelion. It has an orbital period of 309.09 Earth years, and takes about 7.77 Earth hours to complete a single sidereal rotation. This means that a single day on Makemake is less than 8 hours and a single year last as long as 112,897 days. As a classical Kuiper Belt Object, Makemake’s orbit lies far enough from Neptune to remain stable over the age of the Solar System. Unlike plutinos, which can cross Neptune’s orbit, classical KBOs are free from Neptune’s perturbation. Such objects have relatively low eccentricities (below 0.2) and orbit the Sun in much the same way the planets do. 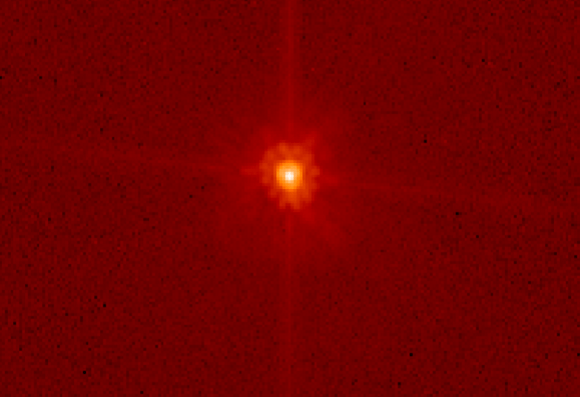 Makemake, however, is a member of the “dynamically hot” class of classical KBOs, meaning that it has a high inclination compared to others in its population. With an estimated mean density of 1.4–3.2 g/cm³, Makemake is believed to be differentiated between an icy surface and a rocky core. Like Pluto and Eris, the surface ice is believed to be composed largely of frozen methane (CH4) and ethane (C2H6). Though evidence exists for traces of nitrogen ice as well, it is nowhere near as prevalent as with Pluto or Triton. Javier Licandro and his colleagues at the Instituto de Astrofisica de Canarias performed examinations of Makemake using the William Herschel Telescope and Telescopio Nazionale Galileo. According to their findings, Makemake has a very bright surface (with a surface albedo of 0.81) which means it closely resembles that of Pluto. In essence, it appears reddish in color (significantly more so than Eris), which also indicates strong concentrations of tholins in the surface ice. This is consistent with the presence of methane ice, which would have turned red due to exposure to solar radiation over time. During it’s 2011 occultation with an 18th-magnitutde star, Makemake abruptly blocked all of its light. These results showed that Makemake lacks a substantial atmosphere, which contradicted earlier assumptions about it having an atmosphere comparable to that of Pluto. However, the presence of methane and possibly nitrogen suggests that Makemake could have a transient atmosphere similar to that of Pluto when it reaches perihelion. Essentially, when Makemake is closest to the Sun, nitrogen and other ices would sublimate, forming a tenuous atmosphere composed of nitrogen gas and hydrocarbons. The existence of an atmosphere would also provide a natural explanation for the nitrogen depletion, which could have been lost over time through the process of atmospheric escape. In April of 2016, observations using the Hubble Space Telescope‘s Wide Field Camera 3 revealed that Makemake had a natural satellite – which was designated S/2015 (136472) 1 (nicknamed MK 2 by the discovery team). It is estimated to be 175 km (110 mi) km in diameter and has a semi-major axis at least 21,000 km (13,000 mi) from Makemake. Currently, no missions have been planned to the Kuiper Belt for the purpose of conducting a survey of Makemake. However, it has been calculated that – based on a launch date of August 21st, 2024, and August 24th, 2036 – a flyby mission to Makemake could take just over 16 years, using a Jupiter gravity assist. On either occasion, Makemake would be approximately 52 AU from the Sun when the spacecraft arrives. Makemake is now the fourth designated dwarf planet in the solar system, and the third Plutoid. In the coming years, it is likely to be joined several more objects in the Trans-Neptunian region that are similar in size, mass, and orbit. And assuming we mount a flyby to the region, we may discover many similar objects, and learn a great deal more about this one. We have many interesting articles on Makemake and the Kuiper Belt here at Universe Today. Here’s How Many Planets are in the Solar System, and Makemake’s Mysterious Atmosphere. Long after telescopes cease operating, their bounty of scientific data continues to amaze. Here’s an example of that: this Herschel Space Telescope image of this dust and gas cloud about 8,000 light-years away. The examination of NGC 7358 revealed a “weird” dusty ring in the cloud — nobody quite knows how it got there — as well as a baker’s dozen of huge dust clumps that could one day form gigantic stars. “The 13 clumps spotted in NGC 7358, some of which lie along the edge of the mystery ring, all are more than 40 times more massive than the sun,” NASA stated. 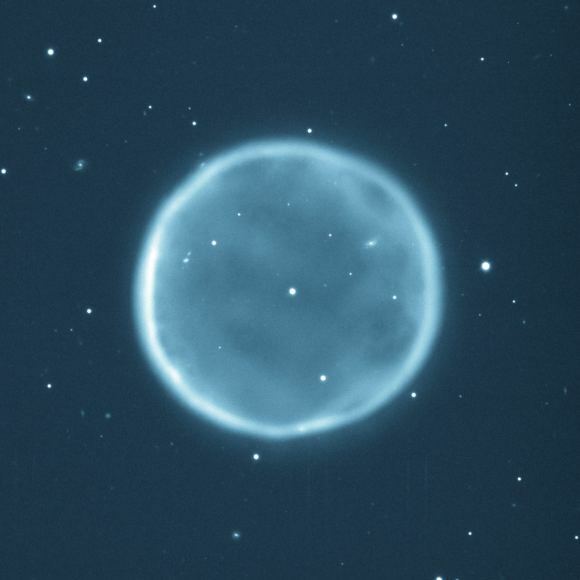 More observations are planned to learn about the nature of the dusty ring. So far, astronomers can say it is 35 light-years at its longest axis, 25 light-years at its shortest-axis, and has a mass of about 500 times of the sun. The astronomers took a look at it with the James Clerk Maxwell Telescope in Hawaii to gain some more information. While the research was published in the Astrophysical Journal about a year ago, the image appears to be a new entry on NASA’s and Herschel’s websites. You can also read the paper (led by Cassandra Fallscheer, a visiting assistant professor of astronomy at Whitman College in Walla Walla, Washington) in preprint version on Arxiv. The Herschel telescope was shut down almost exactly a year ago after the liquid helium that cooled its instruments ran out. Contradicting past theories, cold gas has been found in abundance in some elliptical galaxies — showing that there must be some other explanation why these types of galaxies don’t form new stars. Astronomers believe that the jets from supermassive black holes in these galaxies’ center must push around the gas and prevent stars from forming. Researchers spotted the gas for the first time using old data from the recently retired Herschel space observatory, which was able to peer well into the infrared — where it spotted carbon ions and oxygen atoms. This find stands against the previous belief that these galaxies were “red and dead”, referring to their physical appearance and the fact that they form no new stars. “We looked at eight giant elliptical galaxies that nobody had looked at with Herschel before and we were delighted to find that, contrary to previous belief, six out of eight abound with cold gas”, stated Norbert Werner, a researcher at Stanford University in California who led the study. “These galaxies are red, but with the giant black holes pumping in their hearts, they are definitely not dead,” added Werner. Previously, scientists thought that the galaxies got rid of their cold gas or had used it all up during a burst of earlier star formation. With cold gas found in the majority of the sample, researchers then used other observatories to try to find warmer gas up to tens of millions of Kelvin (or Fahrenheit or Celsius). X-ray information from NASA’s Chandra X-ray Observatory revealed that there is hot gas cooling in six of the eight galaxies, but not in the remaining two of the sample. “This is consistent with theoretical expectations: once cooled, the hot gas would become the warm and cold gas that are observed at longer wavelengths. However, in these galaxies the cooling process somehow stopped, and the cold gas failed to condense and form stars,” the European Space Agency stated. You can read more about the research in the Monthly Notices of the Royal Astronomical Society or in preprint version on Arxiv. A pair of astronomers has proved that we haven’t seen the last of the Herschel Space Observatory! On June 17, 2013, engineers for the Herschel space telescope sent final commands to put the decommissioned observatory into its “graveyard” heliocentric parking orbit, after the liquid helium that cooled the observatory’s instruments was depleted. Now, Nick Howes and Ernesto Guido from the Remanzacco Observatory have used the 2 meter Faulkes Telescope North in Hawaii to take a picture of the infrared observatory as it is moving away from its orbit around the L2 LaGrange Point where it spent the entirety of its mission. Howes told Universe Today that their observations not only improve future chances of it being seen, but also will help astronomers in that the observatory won’t be mistaken for a new asteroid. The Herschel Telescope was imaged by Nick Howes and Ernesto Guido using Faulkes Telescope North in Haleakala, Hawaii, on June 26, 2013. When Howes and Guido realized that JPL’s Horizons coordinate system — which generates coordinates for objects in space like Herschel — would be suspending coordinates for the observatory from the end of June, they quickly and urgently used the information they had on Herschel’s movements to make their observations. Radiation pressure and a host of other factors would have and will continue to affect the position of the spacecraft, but with it getting fainter by the day, Howes and Guido made the effort by taking two nights of observations to try and find Herschel as it drifted away from L2. The orbit of Herschel during its mission. Credit: ESA. Howes, who’d written about Herschel when working in science communications for ESA, contacted several of the mission team via emails, who gave valuable advice on the effects of the final orbital burn. The team have filed their data with the Minor Planet Center, and have worked closely with astronomers at Kitt Peak, who also imaged the Observatory, further refining the observing arc, passing their coordinates even on to astronomers in Chile, with significantly larger telescopes to get even more images of it. The Faulkes Telescope Project is based at the University of South Wales, and the telescopes are operated by the Las Cumbres Observatory Global Telescope Network. The telescopes are also used for educational purposes, and schools using the Faulkes Telescope will be able to follow Herschel as she leaves her orbit to wander around the Sun. It will return to our neck of the Solar System around 2027/2028 (astrometry measured by Howes and Guido is factoring in radiation pressure, so the values are approximate), when it will return at around magnitude 21.7. “The biggest surprise was quite how hot the molecular gas in the innermost central region of the galaxy gets. 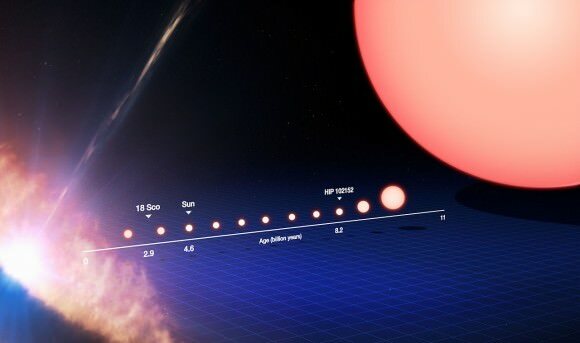 At least some of it is around 1000ºC [1832º F], much hotter than typical interstellar clouds, which are usually only a few tens of degrees above the –273ºC [-460ºF] of absolute zero,” stated the European Space Agency. Herschel, which is out of coolant and winding down its scientific operations, will continue producing results in the next few years as scientists crunch the results. The telescope has found a bunch of basic molecules in the Milky Way that include water vapour and carbon monoxide, and has been engaged in looking to learn more about the gas that surrounds the massive black hole at our galaxy’s center. In a region called Sagittarius* (Sgr A*), this huge black hole — four million times the mass of the sun — is thankfully a safe distance from Earth. It’s 26,000 light years away from the solar system. At left, ionized gas in the galaxy as seen in radio wavelengths; at right, the spectrum at the center seen by Herschel. Credit: Radio-wavelength image: National Radio Astronomy Observatory/Very Large Array (courtesy of C. Lang); spectrum: ESA/Herschel/PACS & SPIRE/J.R. Goicoechea et al. (2013). Trouble is, there’s a heckuva lot of dust blocking our view to the center of the galaxy. Herschel got around that problem by taking pictures in the far-infrared, seeking heat signatures that can bely intense activity in and around the black hole. “Herschel has resolved the far-infrared emission within just 1 light-year of the black hole, making it possible for the first time at these wavelengths to separate emission due to the central cavity from that of the surrounding dense molecular disc,” stated Javier Goicoechea of the Centro de Astrobiología, Spain, lead author of a paper reporting the results.